Former President Bill Clinton listens during a Monday interview about The President is Missing, a novel he wrote with James Patterson. Since he left the White House, Bill Clinton's found time to write books - memoir, policy tomes - never until today fiction. He told me writing a thriller has been a little scary. BILL CLINTON: I had so much fun, but it's - you know, I've never done this before, I mean, with a fiction book. So I'm just nervous (laughter). CLINTON: Jim keeps saying, just relax, and have a good time. Yeah, I mean, it's a pretty - you know, I'm an old dog. It's a new trick. KELLY: Jim would be James Patterson, the author of a zillion thrillers who signed on to co-write with Clinton. Together they're out today with "The President Is Missing." It stars, yes, an American president, in this case one trying to thwart cyber terrorists who want to cripple - completely cripple the United States. So I asked them, how realistic a plotline is that? Could somebody really bring down the whole Internet? JAMES PATTERSON: We talked to dozens of experts in this area, and they do believe that this is possible. And it's - something, you know, on some level like this will happen. KELLY: James Patterson and Bill Clinton - I asked them about another plot twist. Early in the book, their fictional President Duncan wants to meet someone in private, so he puts on a disguise and orders his Secret Service protection to stand down. Could you just order your Secret Service to walk away? Would they obey that order? CLINTON: The answer is, in theory, yes. In practice, it's hard, as you saw. Anybody besides the president who has Secret Service protection can actually sign off of it and basically assume liability. And others have done it. We can find no example where a president ever did it. I never did. Every president wants to 'cause you just get tired of never being alone and in control of your destiny. But it's irresponsible to do. PATTERSON: And there are several lawyers who said, yes, they - it could happen. And you would also find some lawyers who'd say you couldn't do it. But you would have lawyers who'd say, yes, you can do it. KELLY: Was there ever a moment in your presidency that you and Secret Service seriously disagreed over how to proceed? CLINTON: Yes, and I normally deferred to them. When bin Laden had a - you know, a hit job out on me after I tried to take him out, they didn't want me to go to India, Pakistan and Bangladesh. Especially they were worried about Pakistan and Bangladesh. And I thought the worry about Pakistan was wrong. I was more worried about going into Bangladesh, where the government was supportive of the United States and where the people were. But they just didn't have the military capacity to stop this sort of thing. CLINTON: And so I flew there on an unmarked airplane, and I tried to make sure that no Secret Service agents with young children went with me. CLINTON: I did. I - yeah, I did that. KELLY: There are points in the book where it's hard to tell where President Duncan ends and it's really President Clinton you're hearing from. In one chapter, the fictional president delivers a barnstormer of a speech to Congress saying, quote, "our democracy cannot survive its current downward drift into tribalism, extremism and seething resentment. Today it's us versus them in America." I read that and wondered, President Clinton, if you are using fiction here to comment on our real-life moment in history. CLINTON: No, no, I - that's all I'm saying. CLINTON: So no, it's - do I think Hillary got a bad deal? Yeah, I do. But that's not a - the larger problem is that the system - because of organized interest groups, massive money, basically the business model of the way politics is covered, the whole thing favors paralysis. And the voters, when they vote in an emotional state, very often reinforce that. So this is - in the end, it's up to the American people, which is why I wrote it this way. I think when they're calm, 65 to 70 percent of the American people say, I just want somebody to get the show on the road and make it better than it is now. KELLY: But I guess what I'm driving at is whether - the thing about being Bill Clinton is that when you weigh in on politics, it becomes part of the politics inherently. And I wonder whether writing fiction about an American president allows you to weigh in in a different way. PATTERSON: I don't think the book is terribly political. In fact, it isn't. And we really went out of our way. And, you know, in that speech, I mean, you definitely feel a bit President Clinton, and I think that's good. I'm happy that we did it that way. And if I wasn't, I would have said, you know, let's calm the speech down. KELLY: James Patterson - as you can hear, over the course of a 500-page book, he and President Clinton have gotten used to finishing each other's sentences. In recent months, Clinton has been in the news for reasons beyond his book tour. In this #MeToo era, he's come under new scrutiny for his past misconduct with women, both acknowledged and alleged. His fictional protagonist is a widower living an apparently chaste and celibate life. But the book opens with the specter of his possible impeachment on national security grounds. I asked Clinton to read me that passage, a president called to testify as his opponents lay the groundwork to impeach him. CLINTON: (Reading) I'm alone at my chair - no aides, no lawyers, no notes. The American people are not going to see me exchanging hushed whispers with an attorney, my hand over the microphone, removing it to testify that I have no specific recollection of that, Congressman. I'm not hiding. I shouldn't have to be here, and I sure as hell don't want to be here, but here I am, just me, the president of the United States, facing a mob of accusers. KELLY: A mob of accusers - Clinton had plenty back in the '90s and plenty more today both from outside and within his party. The fact is not a lot of people could write that fictional scene with firsthand knowledge, a point I put to Clinton. That's something - not a lot of people have sat in that chair. You have. CLINTON: Yep, and it's really - it's important that people understand that you have to develop the capacity if you really want to serve people to basically almost disengage yourself from whether something is making you angry because it's not fair to you. It's almost like you can't exist, almost like you can't have feelings except for the American people. You shouldn't be mad except on behalf of the American people. Everything else has to be calculation so you can maximize your capacity to do the job you put your hand on the Bible and swore to do. 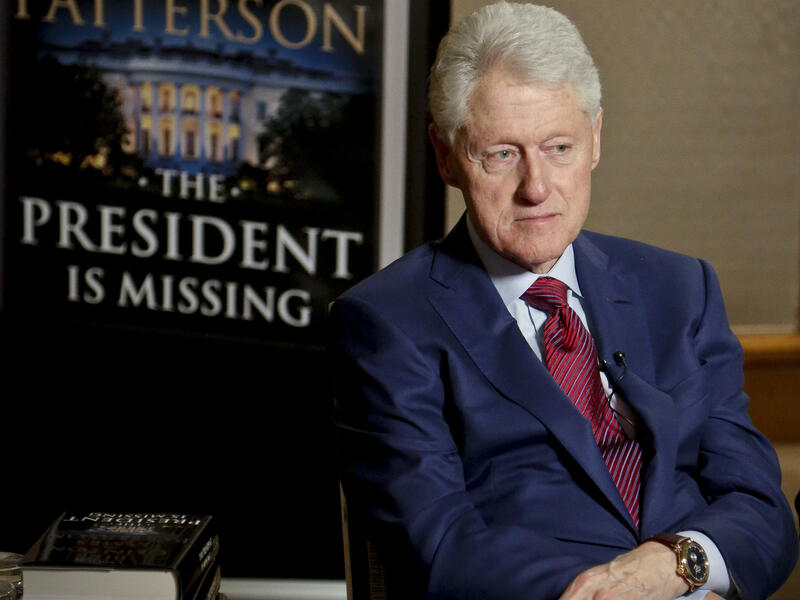 KELLY: President Bill Clinton along with writer James Patterson talking about their new thriller, "The President Is Missing." Transcript provided by NPR, Copyright NPR.